You are currently browsing the tag archive for the ‘National Pork Board’ tag. Last week I attended the National Pork Industry Forum in Phoenix. This is the annual meeting of both the NPPC and the National Pork Board. Dale and the kids joined me on the trip since both my parents and Dale’s mom and her husband are wintering (snowbirds) in the Phoenix area. As you can see by the picture, we got the chance to hike around Superstition Mountain a bit. 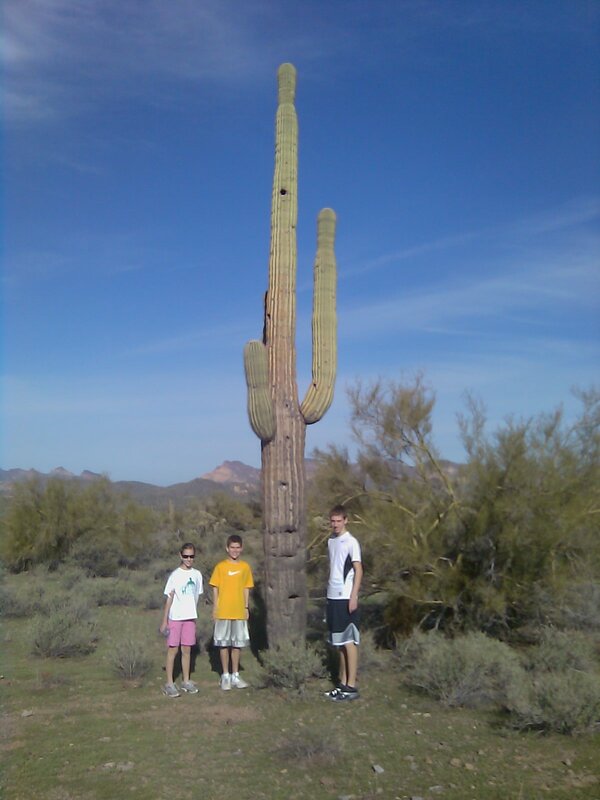 The kids loved the change of scenery with the desert and cactus. Of course, who wouldn’t love 70-80 degree weather too? Most of my time was spent in meetings. I enjoy meeting people from around the country and am always impressed with the leadership and commitment these people have to the pork industry. The National Pork Board introduced its new slogan “Be Inspired”. While The Other White Meat has done the pork industry well, it was time for a change. The new slogan may take a while to catch on, but I like the possibilities. Most everyone is concerned with grain prices and profitability. That doesn’t stop us being the most cost effective producer of high quality pork. The world wants our product and we’ve responded by exporting almost 1 out of 5 pigs produced. The return to Minnesota brought cooler temperatures and snow but it was still nice to have a break, even for only a few days. Steve Meyer, from Paragon Economics made that statement at a pork industry meeting I recently attended. It’s a simple statement, yet very profound. We may call ourselves pork producers, pig farmers, growers, producers or even farm families, but in the end, we have one purpose, to produce food to feed people. Every day Dale gets up and goes out to the barns to feed and take care of the pigs. There are sows to breed, young pigs that need to be checked and the occasional pig that may need extra care. There is feed to grind and animals to be fed. Some days there are gates to be fixed or other repairs that need to be done. The end goal is to send a pig to market that is healthy, efficient and a good source of lean protein for the consumer. The pigs we raise could end up as a dry aged pork chop in a white table restaurant. The ham could be part of a school lunch meal, perhaps the best meal that some kid has for that day. Pork ribs could be part of a tailgate party before a big football game. The loin roast could be part of a hot delicious meal on a cold winter night. The farmers I know are modest, perhaps too modest. They don’t want to call attention to what they do, so unfortunately some people don’t understand what it’s like to raise pigs today. It’s like many other jobs, rewarding, challenging, frustrating and gratifying. But to farmers, it’s more than a job, it’s a livelihood, a passion they have for raising livestock that one day feeds people. Next time you see a farmer, any type of farmer, tell him or her thanks. They may be surprised, but they’ll appreciate your gratitude.